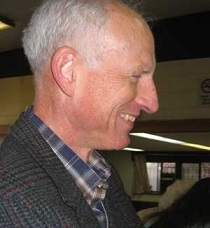 Rebhorn’s most endearing thoughts go toward his wife, Rebecca, and their two daughters, Emma and Hannah… Rebhorn also takes the time to suggest his daughters keep their mourning to a minimum. Gawker’s Dayna Evans and others have described the obituary as “heartbreaking,” but we humbly beg to differ. 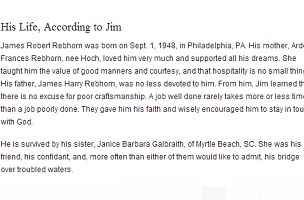 Rebhorn’s life was full of love and balanced, professional success. Through this obituary, the actor presents himself as someone grateful for having been so blessed. As such, to us, it’s more uplifting than heartbreaking. I remember it being my first week of my second year, and was having lunch and coffee at a table at one of the UCLA food courts… and you just happened to be at a nearby table, enjoying your own meal. I recognized you from so much of your acting work, and assumed you were there at UCLA giving a seminar; maybe meeting film school faculty, etc. After I asked you a few questions about the whole “acting” process, you could’ve of left; shined me on; etc., but you didn’t. You gave me some moments of your time; and your experience as an actor which basically became a 20-minute class helping me really understand what actors really want from writers. I thanked you so much for your time then; I thank you even more now. My thoughts and prayers for your family and loved ones.